If you tried running and found it boring or hard, don’t worry. It happens often. Still, I will take for granted that you want to make the most out of your workout time and don’t give up after a few tries. This would be the right decision because, as studies have shown, running IS the best sport you can choose. Moreover, from all the cardio machines out there, specialists have selected the treadmill as the number one option. Why? Read below. When talking about calorie expenditure, we’re talking about how much muscle mass is being used during the workout. The relation is like this: as the amount of muscles used increases, the number of calories you burn goes up. 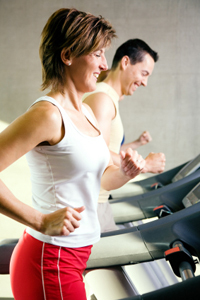 In a treadmills’ case, the expenditure of energy is high during the exercise and after the workout is over. Researchers went even further and compared the results you get on the treadmill with the outcome you get on the elliptical. They focused on combined leg-and-arm exercises and leg-only workouts. The results show that, during combined leg-and-arm workouts, oxygen expenditure, ventilation and rating of perceived exertion are higher than during leg-only workouts. As stride rate and resistance go up, oxygen consumption, heart rate (HR), rating of perceived exertion (RPE), and ventilation go up also. Researchers also compared the treadmill to other equipment like stationary cycle, rowing machine and stair stepper. It seems that working out on the treadmill delivers a higher rate of energy expenditure as opposed to the other machines. With the RPE as indicator, specialists recommend the treadmill as the right indoor machine for users who aim at high energy expenditure. Another result of these studies shows that users who are in to weight-bearing exercises go for higher intensity levels, which means a greater cardio workout. In this scenario, the treadmill is proved to offer a more efficient cardio exercise than the cycle, even when both machines are used at the same intensity level. Those who perform sports that employ running and jumping benefit from a higher mineral density in the bones than sedentary people do. Despite the fact that many people complain about how bothersome running is, it actually keeps down the risk of joint degradation or osteoarthritis. Since this is an issue mostly encountered among people who are no longer in their prime of life, treadmills come in very handy. You don’t have to worry about the weather or about the fact that there is no running area near your house. Once the treadmill is in the house, you only enjoy the benefits of running. All of these researchers conclude, and I concur, that the treadmill is the best cardio machine out there. The usage of a large amount of muscle mass, the high energy expenditure and the fact that you don’t need too many skills to use it, make the treadmill a best choice. Anna Moore is a runner and an advocate for treadmills. She has been running for 5 years, time during which she has had the chance to explore this sport’s benefits. She is also the editor-in-chief at RunReviews.com, a website dedicated to treadmills and workouts. 1. Kravitz, L., R.A. Robergs, V.H. Heyward, D.R. Wagner and K. Powers. Exercise mode and gender comparisons of energy expenditure at self-selected intensities. Medicine and Science in Sports and Exercise, 1997. 2. Mier, C.M., and Y. Feito. Metabolic cost of stride rate, resistance and combined use of arms and legs on the elliptical trainer. Research Quarterly for Exercise and Sport, 2006. 3. Zeni, A.I., M.D. Hoffman and P.S. Clifford. Energy expenditure with indoor exercise machines. Journal of the American Medical Association, 1996a. 4. Cymet, T.C., and V. Sinkov. Does long-distance running cause osteoarthritis? Journal of the American Osteopathic Association, 2006.